Mom, the Intern: A Christmas concert you NEED to go to. A Christmas concert you NEED to go to. I've told you all I'm pretty musical and all that jazz (pun totally intended). A few months ago, I auditioned to sing with Mormon Choral Organizations of America. Much to my excitement, the director so graciously let me in once I found a competent male singer to balance out the numbers. It was a good day ... until I found that male and then actually went to our first rehearsal. Then, it was a seriously GREAT day. I realized this group was so much bigger and more amazing than I ever could have imagined. I left that first rehearsal with my heart soaring, feeling so blessed to be part of something of this magnitude. I immediately called my mom and gushed for a good 15 minutes about how technically and musically talented the choir was. It was a choral experience like none I'd previously had (and I have even sung in Regional and All-State choirs). 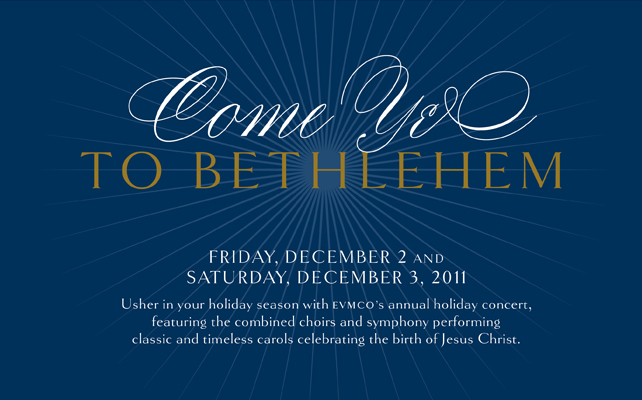 Since then, we've been rehearsing our Christmas music for our upcoming concert at the Mesa Arts Center, titled "Come Ye to Bethlehem." And if you live anywhere near the East Valley, you're cordially invited! I know, you're like, Why would I want to go to a boring CHOIR concert? Well, here's why. -Good choir music is NOT boring, for starters. And this is stellar. So no worries there. You'll be entertained. -I promise you will NOT be disappointed. There is one piece in particular that I cannot sing without becoming physically emotional, the music is just THAT beautiful. I sure hope I can get it together in time for the concert! Anyway, I am so excited for everyone who will attend this concert. Especially the first-timers. They have no idea what they're in for. It's going to knock their socks off! I wish I knew what my performance schedule is for Dec! I want to go to this sooo bad! Maybe I'll request one of the nights off!